It's graduation season around our country and today's blog post is dedicated to superlatives. I'll avoid the typical senior superlatives of "Class Couple" (however, that makes me want to write a post about pairing novels and picture books) or "Best Smile" (but I bet you can guess which book I would vote for from my list). Side Note - I'm definitely going to have a create another post using other various superlatives. For today's post, however, I will focus on the books in our classroom that spent very little time on our bookshelves. These are the books that students were constantly asking for and the books that had name after name on the waiting list. They were most often passed from reader to reader as our students' passion for reading continually grew. Before presenting the list, I do need to disclose some pertinent information. R.J. Palacio's Wonder was our first extended text (think read aloud on steroids) of the year. I'm confident it would have made this list, but it was too good of a story and a character kickoff to not use. Our girls found it hilarious that Jeffery and Tad were continually distracted by the beauty of Lindsey. Sonnenblick's middle school voice is incredibly authentic and he is the master of drawing the reader close to the characters. Anytime I find myself laughing and crying in the same story, I know it's a winner. I purchased the first book in this series last summer, but didn't pick up the others in the series until late this spring. 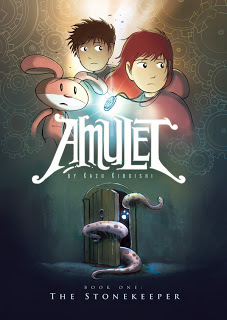 I already spend a decent amount of time at our county public library, but this graphic novel series caused me to stop many times to pick up the other books in the series. 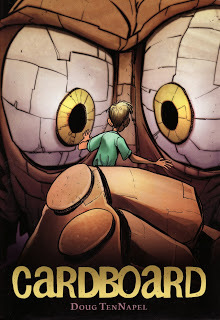 Magical cardboard comes to life and tries to take over the town? That was already enough said, but then I find out that Doug TenNapel was the creator of Earthworm Jim. Mind blown. 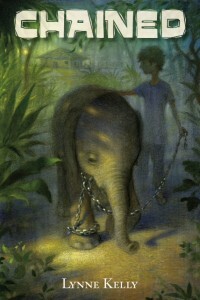 Lynne Kelly's Chained entered our classroom in January after most of our students had already read The One and Only Ivan. Kashmira Sheth's Boys Without Names was also a popular text this year. All we had to do to sell students on this book was tell them that it reminded us of Boys Without Names meets The One and Only Ivan. I almost feel selfish because I enjoyed that our students had not read this one before entering 5th grade. It absolutely hooked so many of our students on reading at the beginning of this school year and they cheered and celebrated when they later found out that it won the Newbery! Now that Ivan has that shiny sticker on it, I don't think there will be too many 5th graders that have not read it before coming to us. I'm okay with that. 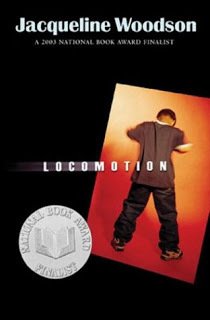 Locomotion is a relatively quick read, but students who are diligent in getting to know Lonnie Collins Motion will truly begin to understand his emotional journey. This text is written in verse and a wonderful entry point into poetry for students who may have already experienced tough times. 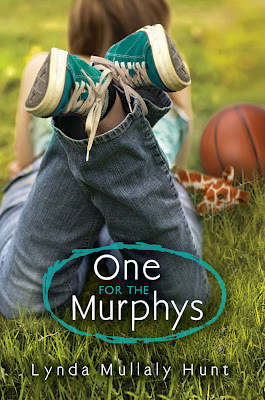 First of all, I am completely biased in regards to One for the Murphys. Lynda Mullaly Hunt, although I do not know her personally, is as nice as can be. 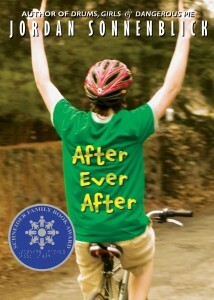 I will say that my students and I loved this book before we knew how nice she was. After reading great things about this book online last summer, we actually borrowed One for the Murphys from a co-worker and returned it at the end of the school year. We now own multiple copies. As previously mentioned, Wonder was our first extended text of the year. It was very natural to say to students, "Did you love Wonder? You'll love this one too." 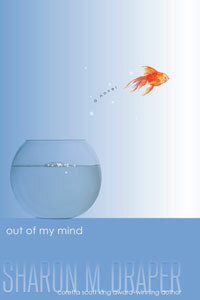 Out of my Mind was released before Wonder and ever since I finished Wonder, I've been trying to figure out which book I like more. I'm perfectly content continuing to be unsure of this. So many graphic novels seem to appeal to boys more than girls and while our girls. I love that our girls have something with which they can now connect (and our boys also loved it). 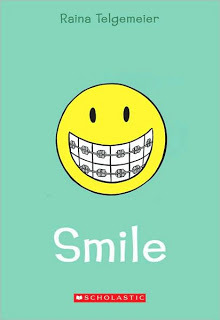 This book will always remind me of multiple different students coming in bright and early in the morning saying one thing: "Mr. O'Neill, I couldn't put Smile down last night and I finished the entire thing!"